Is Display Advertising Getting the Shaft? Should Circuit City bid on their own brand? How much does Google estimate that daily cost at? That estimate may be high, but even if it is off by a factor of 10 Circuit City would be spending a quarter million dollars a month on brand equity they already built up! Given the amount of organic exposure CircuitCity.com currently enjoys for that specific query they should be able to get their ad messaging in the organic search results without paying Google. Exclusively focusing on ROI has advertisers bidding on their own brands and giving Google a large sum of money for the brand equity and user demand that the brand has already established. 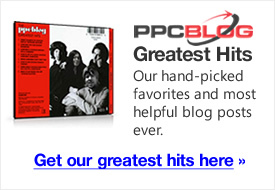 But they should be able to get that ROI without paying Google a cent. 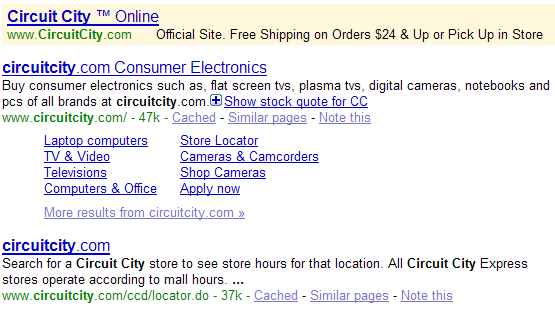 If the above area in the organic search results is not enough space for Circuit City’s brand related search ad strategy, they could always use subdomains and/or launch CircuitCity.org or CircuitCity.net. Google has long pushed the value of tracking the direct ROI of ads as a way of driving their AdWords search ad marketplace, while simultaneously giving advertisers a good deal on content ads (by lowering the perceived value of content ads). The major conclusion of this research: By the time consumers search for a product or service, they’ve often already made up their minds to buy it. And display ads are often an important factor in their reaching that conclusion. Even if the research is true, will Microsoft be able to use it to persuade advertisers to spend more on content ads that they have become accustomed to getting for next to nothing? While I agree with you in principle about the way brands get screwed over by Google with the lack of brand bidding controls I do not believe someone like CircuitCity would ever have to actually pay that much per click. So in reality it probably costs them a lot less per month to remain on top in the paid listings and it also helps them gain a larger share of the visible real estate on the search results. I do wholly agree with your idea of using subdomains for additional brand coverage, this is a very good common practice that new brands should follow. These estimates are intended for company B to bid on company A’s brand, and not company A to bid on company A’s brand. No company ever has to pay more than 5 to 10 cents per click on their own trademark or brand name. The estimate tool does not take into account where the URL will be directed to before coming up with the estimate. If keyword [circuit city] goes to anyjoeshop.com, then that estimate applies. Unfortunately some advertisers are not experienced enough to realize that, and apply the estimated cpc price as their max bid. Interesting piece, and I can confirm that some of the large companies our agency works with are starting to take a very close look at how display (and even offline) media buys impact paid search. This topic is only going to get hotter and hotter over time.